The 23 Ft Ebbtide Deck Boat holds a maximum of 12 people. The 220 hp engine averages 40-50 mph depending on loading (occupancy) and is great for pulling larger more advanced skiers, wakeboards or tubers. 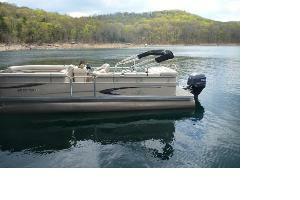 The 25ft Pontoon has a 115hp engine and can tow tubes. 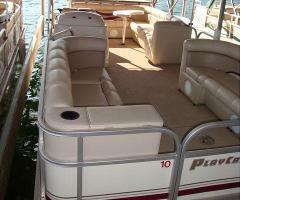 The party pontoon can hold up to 10 people and is great for cruising on the lake. Has a 60 hp engine. 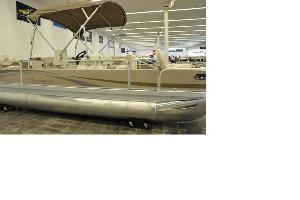 The 22ft Pontoon has a 115hp engine and can tow tubes. The 17 ft ski boat is ideal for a couple with small children. The 19 ft Galxie speedboat has a maximum of 6 people. The 190 hp engine averages 30-40 mph and is great for pulling skiers, wakeboards or tubers. The 20 ft Celebrity speedboat holds a maximum of 8 people. The 220 hp engine averages 40-50 mph and is great for pulling larger more advanced skiers, wakeboards or tubers. This NEW Xpress fishing boat comes with all the bells and whistle. 115hp motor, fish finder, trolling motor, bank charger. Rent for the day and take a few friends out with you. This spacious non-smoking room features a king-sized bed and sitting area. Room at the Inn at Lost Bridge with 2 full size beds. This spacious non-smoking room features a king-sized bed and sitting area. You'll also enjoy the convenience of having a brand new 32' HDTV and coffee maker in your room. Overnight dockage for 20 x 8 ft slip. 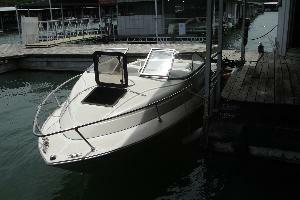 We offer nightly dockage in a covered 20 ft by 9 ft slip. We over nightly dockage in a covered 26 ft slip. Full payment by credit card is due at the time of reservation for all rentals (watercraft, rooms and overnight dockage). Notification of cancellation is required at least 14 days in advance of your booking and is subject to a $25 bookkeeping fee. You have the option to reschedule within the same calendar year until 48 hours prior to your reservation. Drivers License and Major Credit Card must match the individual responsible for the rental. All watercraft require a damage deposit the day of reservation. Must be over 25 years of age to rent or drive rentals. Prices do not include gas, oil or tax. Rentals not picked up 2 hours after rental start time on the day of rental will be considered a no show and will be available for re-rental. No shows result in no refund. All reservations could be canceled by Lost Bridge Marina for weather reasons (wind +20mph, storm, thunderstorm, lightning), but we will continue to operate under overcast skies and/or scattered showers. Boats, Jet Skis, Rooms and/or slips subject to availability due to unforeseen damage or repair beyond lessors control. $150.00 Charge if prop damaged. $25.00 Cleaning fee if applicable. Lessee is responsible for any damage to boat, motor or prop. Payment for any damages must be paid immediately upon check-in of watercraft. Children 12 years old and under must wear life jackets at all times. Upon return of watercraft, customer is responsible for the cost of fuel. Everyone must be seated when boat is moving. No cooking or fires on boats. Late returns shall result in $100 per hour late fee and possible forfeiture of future rentals. Early returns will not result in a refund. If you show up late for your allotted time, no additional time will be granted. INN AT LOST BRIDGE - There is a two night minimum for room rentals. Early departures will not result in a refund. OVERNIGHT DOCKAGE reservations are non-transferable and non-refundable.